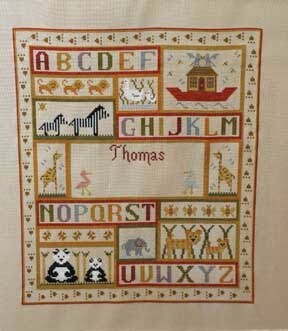 As you can see I have nearly finished my Sampler. 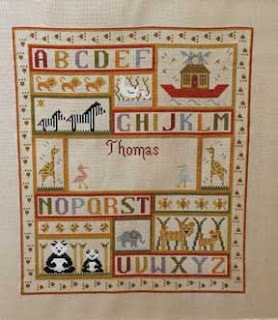 I am on the last panel in the center, there are 2 stork's on this panel, they are meant to be pink not sure as this is for a boy, I tried one out in the pale blue/grey which is already used on the sampler but I can not decide which to use what do you think? I have also decided to knit an animal on the sampler watch this space to see which one I do. looks gorgeous! I think I'd take the blue colour that is used for the letter K fot the stork as well. It looks lovely. I would go with blue for the stork as well.